Pseudotropheus sp. "acei" is living in sandy environments with some spread boulders or tree stumps which lie in the water. This is a species with several color variants which can be found on different locations in entire Lake Malawi. Both the males and females have the same color pattern. 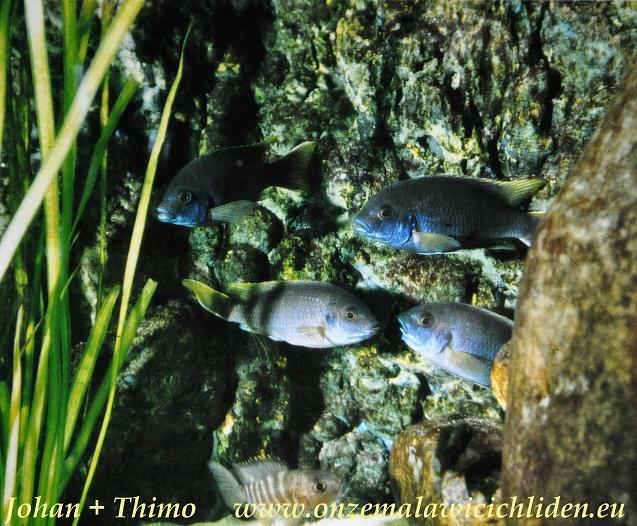 It is one of the most peaceful cichlids of the lake, mutual and against other species they are very tolerant. They can be hold best with multiple females and other fish that live in the same environment in an aquarium with enough swimming space and hiding places. The males are bigger and taller then the females. In my aquarium they became over 10 cm. Unfortunately they have never had any offspring, so I can't tell anything about it. This is the only picture I've got left of the examples which I have hold in my aquarium years ago.